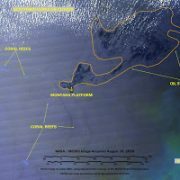 SkyTruth just obtained a full-resolution version of the NASA /MODIS satellite image taken on August 30, 2009, nine days after the blowout and spill began from the Montara offshore oil platform in the Timor Sea off Western Australia. We did some additional processing to enhance features in the ocean, and discovered that slicks and sheen extended even further to the northeast than we thought a few days ago. We’ve uploaded two new MODIS images to our growing online gallery of this event: one is simply the MODIS imagery with no annotation; the other is the same chunk of imagery with SkyTruth’s analysis. 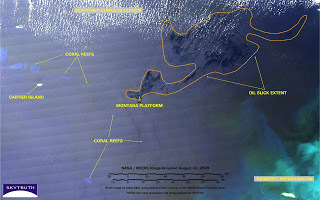 This image shows that oil slicks and sheen from the blowout had already spread across 2,500 square miles of ocean by August 30. And it will take several weeks, possibly months, before this well can be controlled. By the way, just how big is 2,500 square miles? Well, it’s bigger than Delaware. And for our Canadian friends, it’s as big as Banff National Park. If you know any other 2,500-square-mile things, let us know by adding a comment to this post. Thanks to Jesse Allen at NASA and the MODIS Rapid Response Team for providing the original MODIS image. Timor Sea Drilling Spill – More Images Online Timor Sea Drilling Spill – What If?